I have graduated from Tyrvää School of Arts and Crafts, Finland. Besides being a bookbinder by trade I am also a lover of old books and other things related. I believe in antique rubbish, slow living, small pleasures and natural decay. In my books I want to convey the spirit of quality over quantity. I prefer to use organic materials, both new and recycled, to avoid cluttering the Earth with rubbish and to ensure that each book will serve its owner for many years to come. I believe a well-made piece will bring more quality and delight not only in the life of its owner but also for its maker. A good handmade book should be born out of mindfulness and meticulous attention to heritage and detail, not out of business strategies. My work is a constant process of inventing, learning, sometimes shooting myself in the ankle too. Some of my books have been shown in Nordiske Bogbind 2013, Sheffield International Artist's Book Prize 2013, Scripta Manent V and the inaugural Cascais International Book Arts in 2015. I was also recently featured in 500 Handmade Books volume 2, published by Lark Crafts in the USA. I continue working on both commissioned work and personal projects. You can find news and more information about my creative processes by following my blog or my Facebook page. If you're interested in a custom piece, don't hesitate to get in touch. 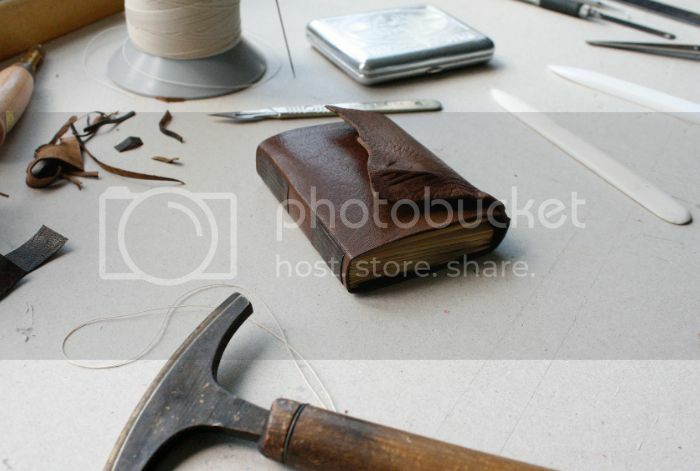 I make albums, diaries, folders and book repair on commission, with several years of experience. You can easily send me a message using the contact form. I speak both English and Finnish.